WASHINGTON, UNITED STATES (26/JUN/2013.) - The U.S. economic performance during the first three months of the year was weaker than initially reported to register a growth of just 1.8 percent, reported the Commerce Department. The figure represented a substantial retreat from the 2.5 growth in the Gross Domestic Product (GDP) which was first reported by the Commerce Department last April. 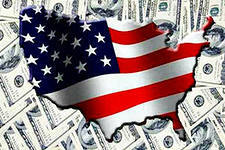 However, the figure was placed above the paltry 0.4 percent that was reported during the fourth quarter of 2012. The new figure was due to a downward revision in domestic consumption, the main driver behind economic growth.